Davidov Partners Architects designed minimalist LSD Residence in Melbourne, Australia for a couple of soon to be empty-nesters. 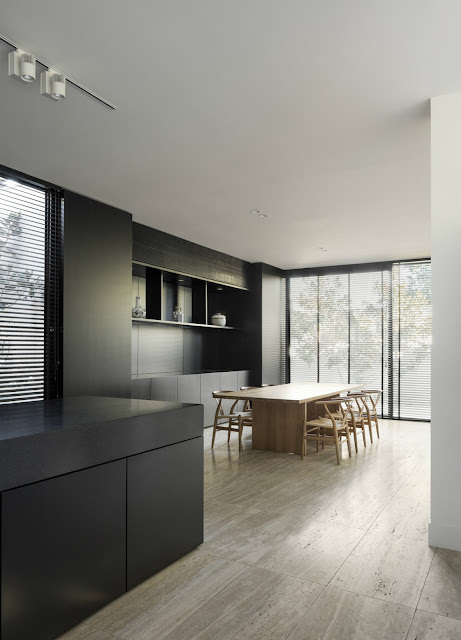 LSD Residence was designed for a couple of soon to be empty-nesters. A significant driver behind the came about from the irregular sized lot on which the residence was built. The aim was to make both inhabitants and visitors unaware of the change in width reducing from 12m to 8m wide. The perceived width of the property is maximised through the careful consideration in the programming of both levels. 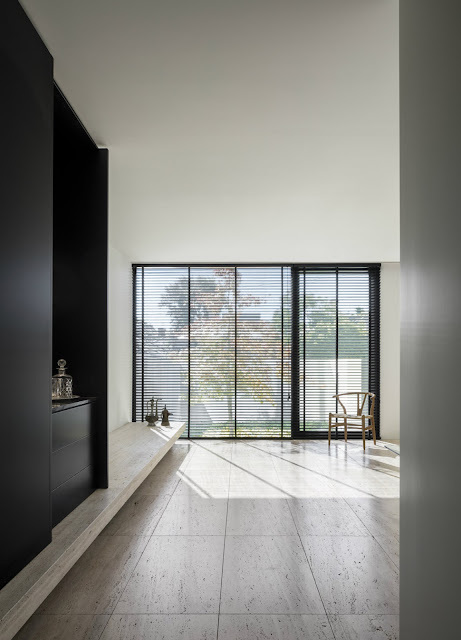 As the site is fairly linear, the design was conceived as 3 blocks punctuated by 2 glazed interstitial zones which contain the staircase/entry and kitchen/bar/alfresco areas. The kitchen’s design proves to be a novel element in LSD Residence. 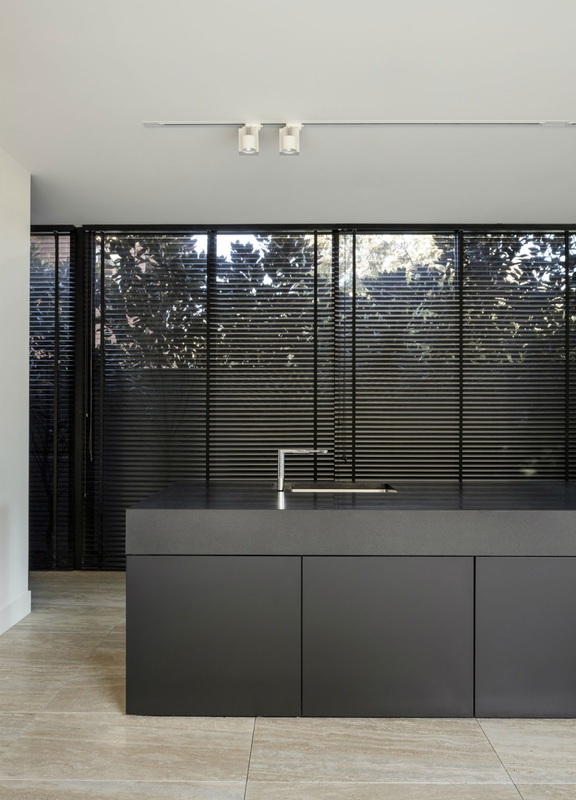 The clients required a public kitchen or bar to be presented in such a way for it to be a natural hub when visitors and family are around, however also wanted another private kitchen for the real cooking and cleaning to take place. This resulted in a butler kitchen designed in close proximity to the central island of the now communal kitchen area. 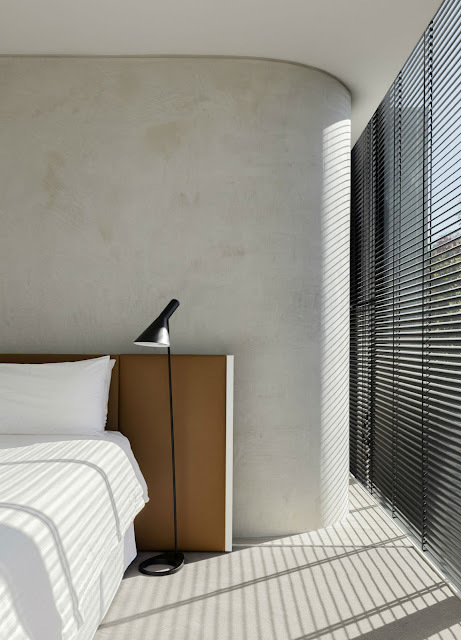 Additionally, the master bedroom, which has been designed in the guise of an open plan hotel suite, has a feature façade glazing which extends from below the floor level to the parapet line allowing for completely full height windows which maximise view lines. 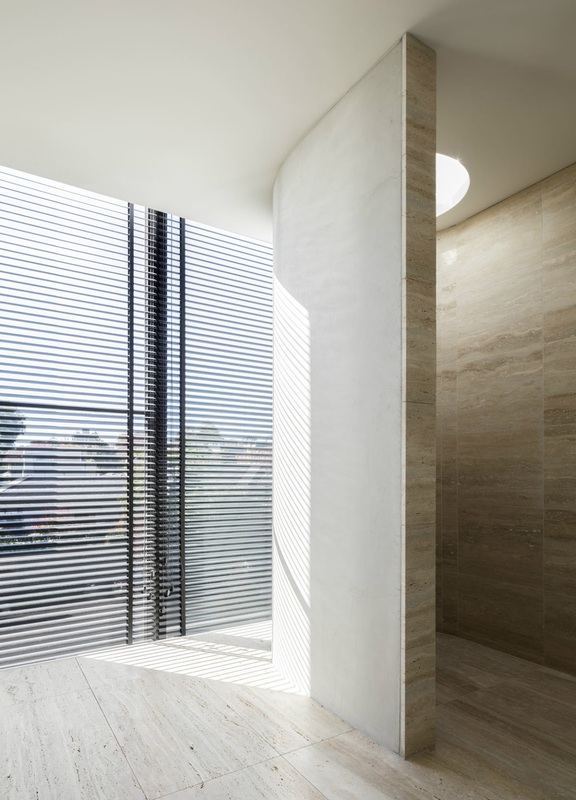 The room also incorporates an innovative oculus in the concrete rendered shower which features a concealed LED lighting halo as the only artificial light source. The curved wall of the shower animates the stark façade of the building, which, depending on the lighting levels and time of day emerges and submerges from view from the street. Apart from the irregular block for the site, a major challenge during the project were town planning restrictions. Attempting to maximise view lines on such a constrained block brought up limitations with overlooking. Additional challenges that needed to be catered to were overshadowing, and boundary walls due to the limited space present. 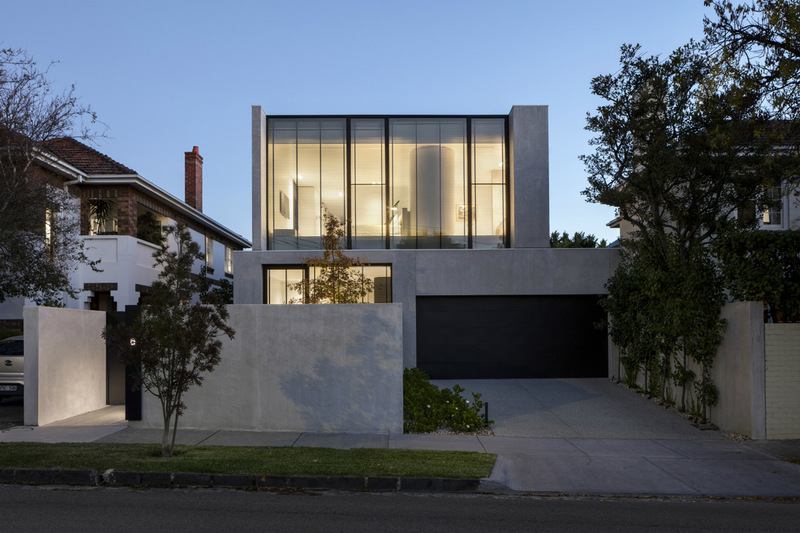 LSD Residence achieves a 6 star energy rating through the use of multiple sustainable design featured. 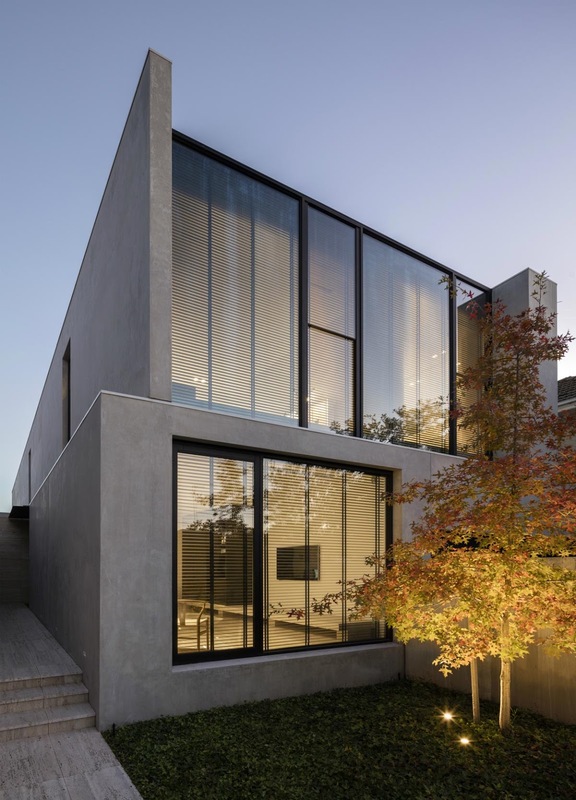 All glass employed in the design is high performance and has a low E value and the use of brick veneer walls and an insulated concrete slab on ground further improves the thermal performance of the house. 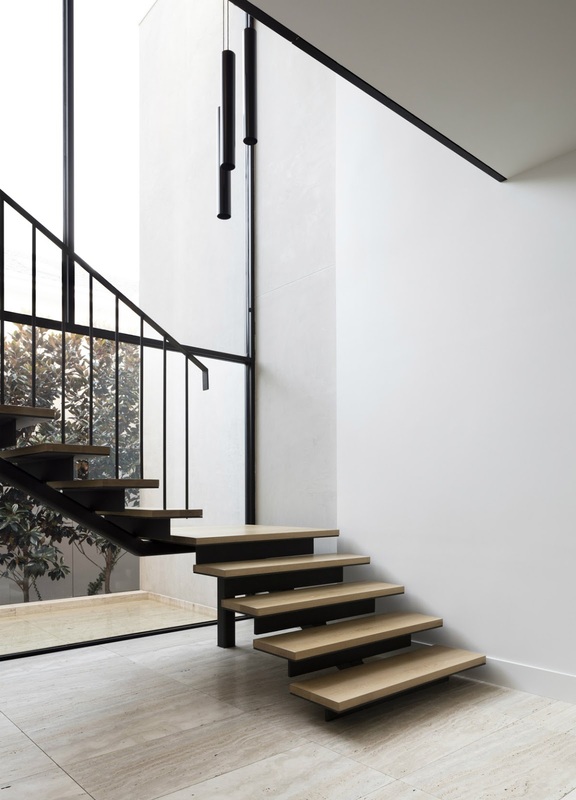 The finishes and render used internally and externally are significantly hard wearing and low maintenance allowing the building to age gracefully. Solar boosted hot water and rain water harvesting is also present in the design. The 2 feature ponds are also intended to assist in passive cooling. The limited palate of natural materials, namely cement render and unfilled travertine are used throughout the house both internally and externally. 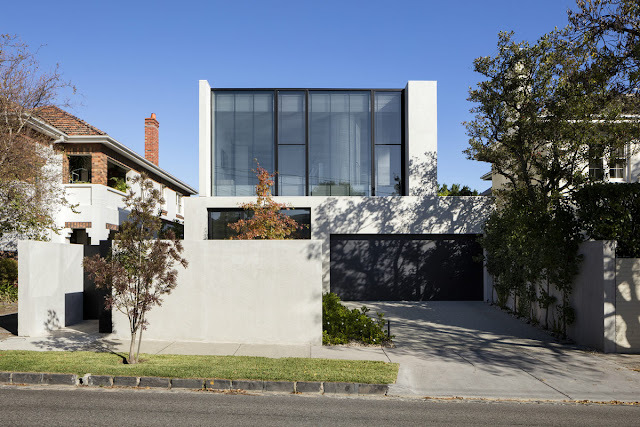 Over time the contrasting effects of external wear and internal protection will allow the inherent nature of these materials to become more pronounced adding another layer of interest and subtle contrast to the house.